Start using Setmore as your free online appointment management software and take customer appointments online from your Setmore Booking Page, website, social media and more. Are you on a quest to find a digital replacement for your pen and paper appointment book that keeps track of your appointments, workshops, vendor meetings, expertise sessions and online schedules? 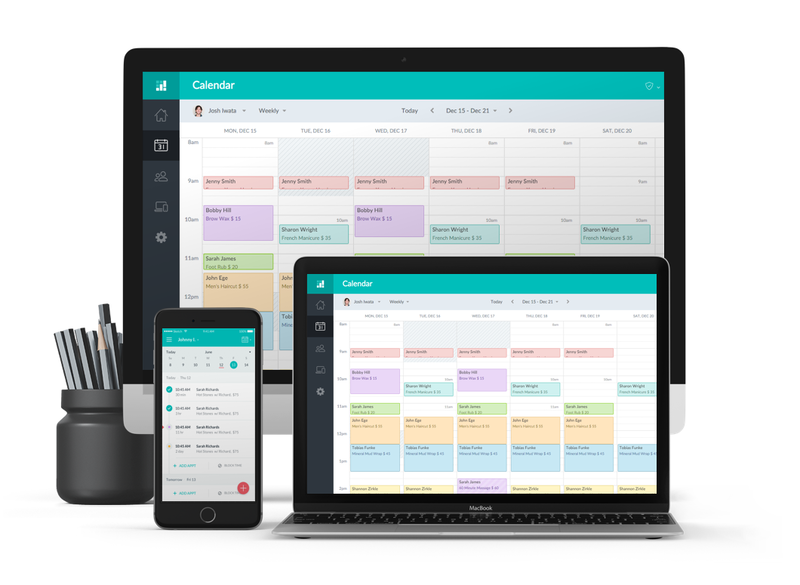 Setmore, an appointment management software that empowers your customers to book appointments online, gives you time to focus on your business and reduces the hassle of telephone booking. Keep your appointments organized in the Setmore calendar along with customer details, appointment dates, service providers and more. Automatically create a customer profile in your Setmore database for each new customer when an appointment is booked. Configure the send time for automated staff notification emails and customer text reminders. Generate a forecast of earnings, appointments and schedules, week by week with the Setmore Dashboard. Use Setmore across all of your devices with the desktop app, Setmore app for Android and the Setmore app for iOS. Setmore comes with an instant messaging feature that lets you connect with Setmore Support instantly. Setmore is so easy to use and requires little to no technical savviness from your end. It comes brimming with simple solutions to manage all of your business appointments in a streamlined interface, viewable and accessible by you and your staff. Book appointments on the Setmore calendar with a simple point-and-click action, then reschedule appointments with a quick drag and drop. As your appointment manager, Setmore can connect with a host of popular online applications to help you stay on top of appointment scheduling. Setmore’s calendar integrates with Google Calendar, Outlook.com, or Office 365 for easy one or two-way syncing. The Setmore booking page can be embedded on your Facebook fan page and websites powered by Wix, Weebly, Drupal, WordPress and others. To help keep your drip campaign lists updated with the latest client info, Setmore also integrates with Mailchimp, Constant Contact, Infusionsoft and Salesforce. Time becomes your ally with Setmore. Discover more time to deliver a phenomenal experience to your customers with Setmore’s customer-facing booking page. Here customers can pick the service, service provider, and the best time that works for them from a list of available time slots. Setmore helps you migrate appointment scheduling and management to the online realm, enabling your business to reduce its paper trail. How? Setmore sends appointment reminders through email, and with a Premium account, Setmore also sends text/SMS reminders to ensure your customers don’t miss an upcoming appointment. Setmore also comes with an online payment system powered by Stripe payments and PayPal so you can accept payments from your customers at the time of booking. Pairing your business with an appointment manager as powerful of Setmore helps you in more ways than one. You’ll get more appointments booked, save more money, and like magic you’ll have more time up your sleeves.